Uglyworld #855 - No Ways Hosays (300-365), originally uploaded by www.bazpics.com. It's been somewhat of a tough week for the little Uglies that live with us, what with Mireille's gran dying last Friday, the funeral taking place tomorrow and me having to get ready to head off to America again this Friday. With my case lying partially packed and what I can only describe as it's contents having exploded all over the room it's more than understandable that the gang are spending more time outside in the garden today. While having a breather myself in the garden I witnessed a funny conversation between Bossy and Wedgehead. Wedgie: "Thanks, keeps me warms"
Bossy: "Can I borrows it?" Wedgie: "I don't thinks so, you has your capes anyways"
Bossy: "Can I just tries it ons then?" 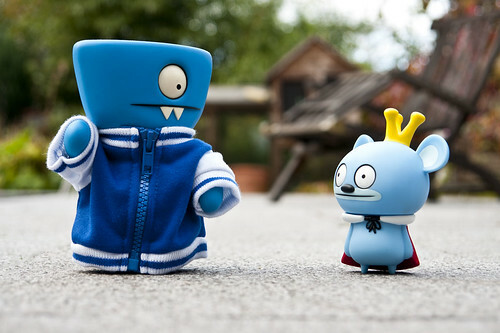 Wedgie: "No, cause then I'd gets cold"
Wedgehead isn't up for handing his jacket over to Bossy, no matter what the cost!